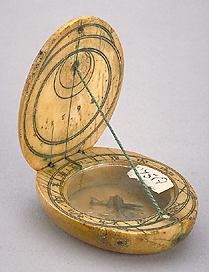 Epact: Diptych Dial unsigned, late 16th century ? This oval-shaped dial resembles the style of 16th-century Nuremberg makers but the work is quite crude. The date engraved on the inside of the upper leaf refers to the last decade of the 16th century, but the last figure cannot be read.